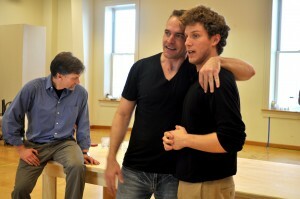 Photo of Brent Harris, Gene Gillette and Nick Dillenburg in rehearsal taken by Nicole Geldart. I can easily identify with Proteus’ situation. He’s in love for the first time and has the misfortune of having these feelings before his good friend. The general sentiment among the guys I played football with in high school was “bros before hos.” And as coarse as that sounds, I was always so concerned with what other people thought that it affected me. In the play, Valentine is giving Proteus a hard time for having fallen in love with Julia, and the main way these guys express themselves to each other is through sarcasm and insult. They rarely channel their feelings directly, for fear of insult. And then Proteus fears even to tell his father, which doesn’t turn out well either. Left to his own thoughts, Proteus wants to punch a wall. I can remember a couple of times when I actually did! Those were some of the best and worst times of my life, coming upon these emotions and situations for the first time. Falling in love, having a best friend, feeling on top of the world because your football team was going to the state tournament. I felt untouchable until proven otherwise. I can also remember the fallout when my best friend suddenly had a girlfriend with whom he spent all his time and I was left out in the cold, feeling forgotten. It may seem a little dramatic, but back then that was my whole world.